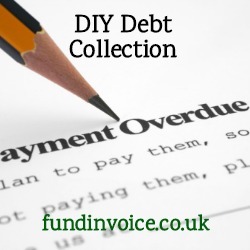 We are sometimes asked for help collecting overdue debts. If there are numerous debts or if they are substantial enough there are providers that will handle the case for you, however when the debt is smaller, maybe just a few thousand pounds, although important to you, you may also find that it is often not large enough to warrant getting professional debt collectors, or perhaps even solicitors involved. We recently had a case where a company had a debt owed, there was no commercial dispute involved, but the amount of the debt was really not large enough to warrant being handled by a solicitor, or debt collection agency. Costs would have eaten up a large proportion of the money that was owed. Below are some suggestions about how the creditor could handle the debt collection themselves - DIY debt collection if you like. Involving a solicitor should always remain your last option because of the costs, especially with relatively small outstanding debts. Firstly, with any amount owed you should follow a solid credit control process. We have a full credit control procedure within our free credit control guide, which also covers how to issue a final demand under the section on "Statutory Demands" - this is the final action within your process prior to taking legal action. That section of the guide includes a link to the Government's website which should be helpful regarding the issue of a statutory demand. The guide also covers other monies you may be able seek to recover e.g. statutory interest on the unpaid debt. Another useful Government resource is Money Claim Online (MCOL) https://www.moneyclaim.gov.uk/web/mcol/welcome which deals with applying for County Court Judgements (a court judgement that can then be enforced against a debtor) or Winding Up Petitions (which is an order to cease the operations of a business and use its assets to pay off its creditors). There are pros and cons as to which type of action you take. However, the Money Claim Online system allows you to instigate this process yourself, rather than needing to involve a solicitors. Typically the cost of using a solicitor to invoke either of these instruments could be between £1K and 2K. If you have any doubts, you should of course seek advice from a Solicitor, but these useful resources may help you to hand your debt recovery yourself.